The last time I saw Martha Wainwright, I missed half her set due to an unfortunate venue timing mixup. That wasn’t the first, and it won’t be the last time that I’m late for a show. It was, however, the most memorable. The remainder was so captivating that it remains on my shortlist of top Toronto Jazz Festival shows. I was not going to miss the start of her CMW appearance. Martha Wainwright controls her voice the way rocket surgeons control their finely tuned rockets. Fortunately, I was able to get to the El mo in plenty of time to set up camp. She strode on stage in a bejewelled jacket as if just dismounting from her trusty Harley, then launched into an intimate set of solo acoustic guitar. Her voice is so signature that it really stands in a category all its own. She can serenade like a bird, evoke the singsong qualities of an innocent child, or growl like a rocker. 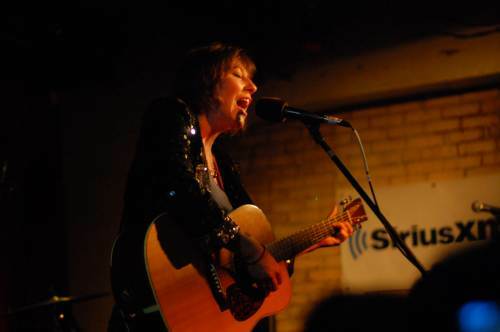 Martha Wainwright controls her voice the way rocket surgeons control their finely tuned rockets. This was a decidedly different Martha from the one I saw at the jazz fest. That Martha was a demure jazz vixen backed by double bass and warm guitar singing songs from the late great Edith Piaf. That Martha paired nicely with a glass of merlot. This Martha was as ready for a rock show as she was the camp fire. This Martha worked best with some beer. That she can so easily move from chill to elegant and back again underlines her versatility as an artist. Martha Wainwright has no upcoming shows, though I would consider flying somewhere to see her again.